I don't know about you, but I always worry about how my children will turn out as adults. Will they be compassionate and kind? Will they be honest in both words and actions? Will they desire to help and serve others? My goal in homeschooling is to create a lifelong love of learning. My goal in parenting is to raise children who have a desire to be productive and virtuous citizens in a lost world. Recently, I was given the chance to review We Choose Virtues, and I decided it would be a good opportunity to make a more concentrated effort to remind the boys of the virtues we seek in them. We Choose Virtues has various items for all ages, and as part of the review I received the Parenting Cards ($38.49) and We Choose Virtues Download Bundle ($7.99) which included the Kids of VirtueVille Coloring Book, Family Character Assessment, Teacher's Handbook, Butterfly Awards for Kids, and Sing Along Song Sheets. These cards are a durable cardstock material. They are geared for children 3-11 years old and are ideal for a family environment. I used them with the boys who are currently 4 and 7 years old, and I think they are the perfect target age for this program. There is a memory verse on each card that you can use when discussing the traits. We Choose Virtues offers two versions of their cards. We received the KJV as that is our preference, but there is also a NIrV set of cards. Otherwise the sets are the same, but if you have a specific preference, the KJV only offers Old Testament verses while the NIrV pulls from both the Old and New Testaments. The front of the cards have the Virtue and what behaviors we demonstrate (and do not demonstrate) when we are Obedient or Helpful or Attentive. On the back of the card is a challenge for the family and several ideas for putting the virtue into practice. The Teacher's Handbook is more about encouraging the teacher who is using the program in a classroom setting (the Parenting Cards are essentially the Teacher Cards for home) but many of the ideas are transferable to a family, or even a co-op setting. The Family Character Assessment is something everyone in the family can do. You determine on a scale of 1-10 where your behavior rates for each Virtue. As time goes on, you can reevaluate and see if your behavior has improved. The Butterfly Awards are great for when you see improvement in your kiddos and want to offer them a little recognition for using their virtues. The Sing-Along songs and the Kids of VirtueVille Coloring Book are great for the regular discussions and lessons. The songs are catchy and are meant to be sung to the tune of popular children's/folk songs. Even weeks after learning a song, I'd hear one of the boys singing it to his brother. The coloring book has a page for each child represented on the Parenting Cards, plus a few extra puzzle type pages. We usually focused on one virtue each week. I would spread the activities out over the week, but we would read the card, review the memory verse several times, read corresponding Bible passages, sing the song during the week and color the pictures. We Choose Virtues offers a great tool called Memory Verses, Bible Heroes and Truths for free if you want to include a more Biblical perspective. Emory took creative liberty with his colors, but Elliott wanted his Kids to look exactly like they did on the cards. I keep the card on the fridge during the week, so it is a visible reminder of what we are working on during the week. The activities presented on the card or within the Teacher's Handbook can be done specifically as a lesson, but sometimes I think they can also be received when I just work them in "in the moment" so that the boys can see exactly why and how each virtue can be demonstrated. One of the recommendations in the Teacher's Handbook was to work the Virtues in as classroom rules. I think families try to do this naturally, but I also think this would be a great idea for co-ops as well. Some children need a little extra encouragement with positive behaviors, or eliminating specific negative behaviors. 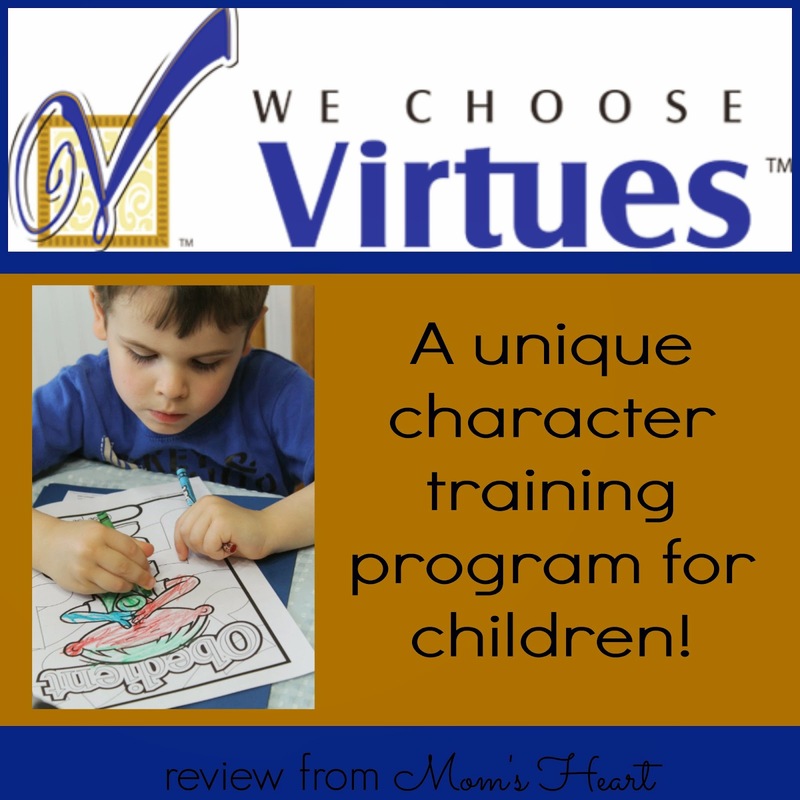 We Choose Virtues offers a fun and unique way to reinforce positive behaviors for younger children. I liked the visual reinforcement of the cards, and they are colorful and engaging for kids. The boys liked the variety of activities. My 7 year old was always asking what stories we would be reading next to go with our cards, and they both loved the descriptions of the VirtueVille Kids. However, the intent of the program is not to focus on one virtue a week, but to weave these positive attributes into our everyday life until they are natural behaviors, and that is what I love. 1. JUNE: *Promo Code BIG50 for 50% off our amazing set of 12 11x17 Kids of VirtueVille Posters! This is the first time we have ever offered these posters at this price. They are great for school classrooms, Kids Church, or your homeschool room. Kids love them for their bedrooms, bathrooms and kids’ hallways. 2. JUNE-AUGUST: *Promo Code BTS20 for 20% off anything in our WCV Store. This includes any kit. Let’s start School with Virtues this year! In addition the parenting cards for younger children, the Crew also reviewed the Youth Virtues Journal, so there's something for all ages, and you can find more information on Facebook, Pinterest and the We Choose Virtues Blog.